There you have it. Deniers will claim that they're the ones unfettered by dogma, that no one else is actually following the science. And yet when predictions come true, the ultimate yardstick for testing hypotheses, rather than say, "Hey, there might be something of interest here! ", it is dismissed out of hand as a fluke. Who has an agenda, Shootist? The summary text relies on subjective data to call the predictions accurate, e.g. drought-prone regions receive less rainfall (OMG! ), Antartica ice .., bowhead whales etc. Where is the feedback mechanism that is critical to the alarmist story? Predictions of linear changes are trivial to model. Where is the feedback? The real data is beating or at least tied with the exponential curve given in 1981. That proves a positive, self-reinforcing feedback is occurring, at least on average. Positive feedback is absolutely known to be true due to the 3 decades of average annual melting day anomaly trend observations for regions north of 60N, since this paper was written. Also, we are not far along enough in the process to get a significant positive feedback from CO2 or methane bombs from permafrost. That's probably still 5 to 10 years away before it starts to become detectable substantially, and maybe decades before it becomes statistically significant. Predicted that the trend of getting warmer that started at end of LIA would continue. I salute him. Eh, Hansen is a bit of an easy target, and he likes it that way. He was arrested in D.C. a few months ago for protesting. Not exactly the most objective source of information. Try to google "james hansen failed predictions" and see how much comes up. By the way, take a look at the graph shown in the story above. Then figure out what the Y axis represents (Ta). 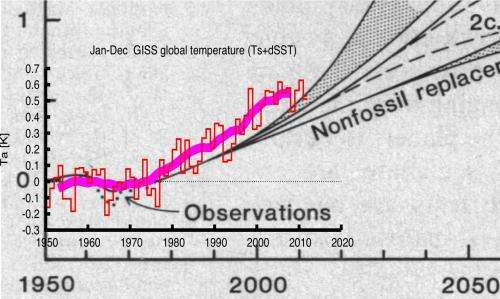 Then look up what they overlayed in pink (GISS Land-Ocean Temperature INDEX). Then ask yourself if you have ever heard of a phrase which involves apples and oranges, or a phrase that involves picking cherries. I am perfectly fine with giving Hansen credit for the good work he has done, but the above story is a publicity stunt designed for people who are too lazy to do a google search and/or follow links to sources. "This ikaite record qualitatively supports that both the Medieval Warm Period and Little Ice Age extended to the Antarctic Peninsula." It is unfortunate that my research, An ikaite record of late Holocene climate at the Antarctic Peninsula, recently published in Earth and Planetary Science Letters, has been misrepresented by a number of media outlets. Several of these media articles assert that our study claims the entire Earth heated up during medieval times without human CO2 emissions. We clearly state in our paper that we studied one site at the Antarctic Peninsula. The results should not be extrapolated to make assumptions about climate conditions across the entire globe. Other statements, such as the study throws doubt on orthodoxies around global warming, completely misrepresent our conclusions. Our study does not question the well-established anthropogenic warming trend. And your comment doesn't strike you in the least as somewhat odd? I thought people had the right to protest in the country of free speech. Arrested for protesting and therefor not a objective source of information. Hm.. So Manhattan is now underwater is it? I agree Vendi! Hansen deserves a Nobel Prize! A BIG FAT NOBEL that he can wave in the face of the environmental political morons and the minions of right wing bleeding hearts. Conservatism dug it's grave quickly with its broad anti-environment positions anti global warming. Facts are facts. I think bashing either side of the political spectrum is very unproductive. However, if it's going to be done, please do it correctly. The left are the bleeding hearts, dear. It's the right that contains the warhawks, death penalty advocates, and no social safety net groups. Steve S - your quotation by Lu is his wish on how his data should be used the quotation I selected is from the abstract of the paper, that shows the LIA was not regional but was trans hemispheric (global). That Lu may after the fact wish to direct how is data is used is not relevant to the data presented in the paper. "We clearly state in our paper that we studied one site at the Antarctic Peninsula. The results should not be extrapolated to make assumptions about climate conditions across the entire globe." The paper extract states LIA & MWP "extended" to the antarctic. That Lu may wish to instruct others oh how to use the data provided is again not relevant to the data provided. "our ikaite record builds hte case that the oscillations of the MWP and LIA are global in there extent and there impact reaches as far South as the Antarctic Peninsula"
accidental repost of above statement showing what the peer reviewed paper by Lu stated as opposed to his later non peer review requests on the use of the data. "The late Holocene climate pattern inferred from 18Ohydra and 18OCaCO3 is comparable to other records from the region and our ikaite record provides new support that the MWP and LIA might have influenced the AP." a quantitative climatic proxy it gives no indication of the magnitude of the temperature changes. Figure 6 compares the eleven data points to other climate proxies from the area and clearly shows the warming and cooling occurring later than the North Atlantic. So, Lu does support LIA and MWP being not regional but global in scale. "Ikaite record indicates that the influence of LIA and MWP reached the AP." Abstract Lu. Unless one wishes to claim that Sweden and Antarctica are in the same region. "The resolution of our record is insufficient to constrain the ages of these climatic oscillations in the Southern hemisphere relative to their expression in the Northern hemisphere, but our ikaite record builds the case that the oscillations of the MWP and LIA are global in their extent and their impact reaches as far South as the Antarctic Peninsula, while prior studies in the AP region have had mixed results." Also from the section "4.4. 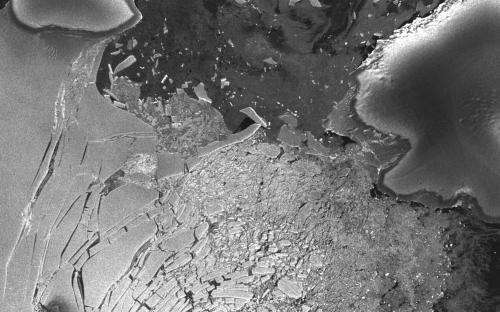 Isotopic signatures of ikaite indicating climate changes?" "There is a notable lag between the onset of MWP at the western AP and at the eastern AP according to this SST record and our ikaite record although this observation needs to be confirmed by additional records. On the eastern AP, no significant change in foraminifera assemblage at Firth of Tay was observed that could correspond with the Medieval Warm Period, Little Ice Age, or the warming over the last century (Majewski and Anderson, 2009)." Thank you for the context. The first paragraph you quote shows that the preponderance of evidence in the paper show the LIA AND MWP to be not regional, but global. and warming in the Firth of Tay during the MWP"
pg 114 of paper lu et al. I disagree, I think it shows that "The resolution of our record is insufficient to constrain the ages of these climatic oscillations in the Southern hemisphere relative to their expression in the Northern hemisphere"
"On the eastern AP, no significant change in foraminifera assemblage at Firth of Tay was observed that could correspond with the Medieval Warm Period, Little Ice Age, or the warming over the last century (Majewski and Anderson, 2009)." "We tentatively interpret this shift in ikaite isotopic values as the result of meltwater invasion,and warming in the Firth of Tay during the MWP"
Thus the paper supports LIA and MWP even in the local of the Firth of Tay. "The resolution of our record is insufficient to constrain the ages of these climatic oscillations in the Southern hemisphere relative to their expression in the Northern hemisphere"
"At this stage, the geochemistry of ikaite serves as a qualitative, rather than a quantitative, climatic proxy, because it remains challenging to account for kinetic effects on uptake of 18O into the carbonate during crystallization and any post-crystallization exchange of 18Ohydra signal." From the data it is not possible to say precisely when and to what degree the temperature changed. is true of all proxies to some extent. "our ikaite record builds the case that the oscillations of the MWP and LIA are global in there extent and there impact reaches as far South as the Antarctic Peninsula"
You may quote the press release I will stay with the actual paper. Argument from absurdity? You still aren't a very good debater, even after all the times I have tried to give you pointers on how to be more effective at debating. Hansen has made frequent public statements that he is an environmental advocate. He is very open about the fact that he is biased in favor of environmental special interest groups. He is proud of it. A biased source is not "objective". That's his choice. BTW, he's an administrator, not a scientist. Gavin Schmidt is the one who runs the actual science at GISS these days, as far as I know. He's not very objective either though. Your statement is true for any controversial subject, just insert abortion, religion, politics, school choice, unions, etc. into the blanks. I've said this before, but I'm sure you'll agree with me: MOST people feel that they MUST form an opinion on those types of things, whether they know anything about it or not. That usually divides right down the political affiliation lines, regardless of education, gender, race, etc. I think this applies to the discussion of the Lu paper to some extent also. Lu seems to be taking the rational stance that one sample isn't enough to say what some people are saying. I see lots of instances these days where people try to make grand claims based on evidence which doesn't really support such grand claims. Extremeists on both sides do it regularly. For example, luke-warmers will point out that warming has paused for something like 15 years now. Then they will try to say that means something is wrong with global warming theory. Obviously, 15 years isn't a long enough time span to have any meaning, but most people don't know that. 15 years seems like a long time to people. lol. Or, you have people on the opposite side bringing up every unusual weather event, as if unusual weather events are something new, or as if they have increased. Again, most people have too little knowledge of the facts to realize the folly of that claim, since the satellite record of weather only goes back to 1979. In this case, 30 years seems like a long time for most people. lol. That stuff is only loosely associated with the original post here though, so it's kinda getting off on a tangent like the Lu discussion. Anybody want to talk about Hansen's prediction track record? What else did he predict beside the stuff in this article? Overall though, I don't think it is fair to judge either way yet, in regard to successful or failed predictions. Some predictions are silly, like the IPCC prediction of massive climate refugees which was supposed to have begun already. Serious predictions for global warming climate change, on the other hand, aren't really supposed to be statistically detectable for another few decades. 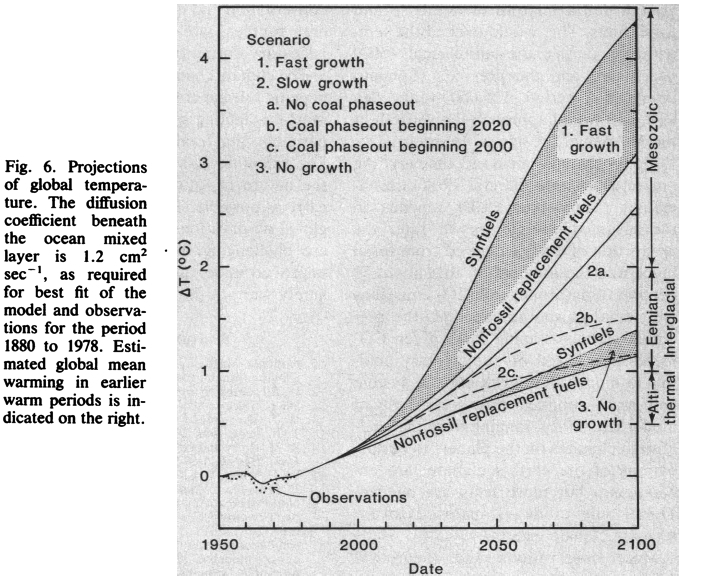 Hansen has a habit of predicting noticeable change on shorter time scales than most other researchers. Even Michael Mann has made statements contrary to Hansen's short time scale predictions. The question of time scales is an interesting one, and is often discussed in a friendly tone amongst serious people on both sides. How long of a time period do you need before you can rule out natural variability in a given climate situation, such as temperature, or rainfall? Do you need 10 years? 20? 50? 1000? Are you saying that you only trust immoral, unthinking scientists?? Wow, you're on a roll. Now it's a straw man argument. I know I've told you before how poor a straw man is as a debate tactic. You are really a slow learner. I'll answer your question though. I trust scientists who make efforts to keep thier personal views out of their research. That isn't an easy thing to do, but most scientists try. Hansen is very open about the fact that he does exactly the opposite, as much as he can. He's been asked by his boss to make it clear when he is expressing his personal views in public speaking events, and Hansen sometimes does, but not usually. His most recent talk in Edinburgh is a good example of that. Liar. The IPCC never predicted climate refugees in 2012. There's a difference between a lie and getting one part of the UN confused with another. Still the UN though. And it was 2010, not 2012. Funny, I don't see the refugees. It's claims like that which make average people ignore it. Careful there Gswift you man have spoken too soon..
1989, Mustafa Tolba, Executive Director of UNEP, was claiming that 'as many as 50 million people could become environmental refugees' if the world did not act to support sustainable development (Tolba 1989: 25). Note UNEP and IPCC are joined at the hip - read MOU linked below UNEP is the support for IPCC. Our study does not question the well-established anthropogenic warming trend. That seems to be a big disclaimer toward what some of the "denier" class would like lay people to believe. Regardless, Anthropogenic Global Warming is pretty much FACT anyway so who cares what G7 says. Has anyone else noticed how they cut off the last few years of the trend line? Is this to avoid showing that global warming has stalled? Victory! All five official global climate monitoring bodies agree Global Warming stopped in 2002 and sea level has been dropping since 2007. The IPCC said the effect of man-made green gasses is insignificant compared to the effects of solar intensity, oceanic oscillations, solar proximity and other natural variations. And the effect of man-made GHG on climate in four decades may be negative. In the last 10,500 years global climate was warmer than it is now. It was colder than now only 13% of those years. Once you remove your cherry picked starting date your claimed stall vanishes. Do you have trouble telling time? The stall started when it started. Trying to prove it didn't start at another time is meaningless drivel. That would make you a liar wouldn't it? The liar would be the one trying to obfuscate the truth (you). "It is shown that the anthropogenic carbon dioxide warming should emerge from the noise level of natural climate variability by the end of the century,"
Is definitely false. Correlation says nothing about cause. My, my... How absolutely unscientific of you. Certainly you must know when your claimed stall started. Did it start yesterday? Last week? Last month? A claimed stall over such a short period would of course have no statistical significance would it? That depends on your purpose. So your credibility in your claim that there has been a "stall" lives and dies on the statistical significance of the data over the period in question. A period that you now refuse to specify. Seriously? If you don't know this, or can't figure it out from my posts, you are definitely very stupid, or a "climate 'bot." Now if we take the starting period to be 1997 or earlier we find that the trend is upward. The stall didn't start in 1997. If we take the data to be 1999 then the trend is also upward. It didn't start in 1999 either. You have fixated on the year 1998 as your starting point because 1998 is an anomalously warm year due to anomalously high El-Nino ocean temperatures. Whatever. It started then because that's how far back I could go showing no net global warming. ...but the data set for 2012 is incomplete. So by selecting that date you have shown that your claim has no statistical significance. More recently you have selected the last 10 years of data in your claim that there has been a stall. Only as it's relevant to certain physorg articles and/or official data sets. ...as the normal temperature fluctuations over that period are vastly larger than the temperature trend that you are claiming. Obviously then, you still don't know what a trend is. Over such periods an observed trend of 0'C has no more statistical significance than a trend of .25'C or -.25'C. Sure it does. 0'C is 0 and the others deviate by .25'C. One can easily cancel or even magnify the other. The anticipated .1'C per decade rise would be masked by natural fluctuations that could put the observed trend as high as .35'C or as low as -.15'C. What are you talking about? The trend is what it is. An analysis of global temperatures by independent statisticians shows the Earth is still warming and not cooling as some global warming skeptics are claiming. This claim is more than three years old. Things have changed. How sad for you that your source of data excludes large regions around the poles. Now why would you choose to omit the regions of the earth that are warming the fastest? Oh yeah? Why don't you please explain how the greenhouse effect is "heating the poles the fastest," when they get the least sunlight! Is it magic? Mathematicians who are experts in statistics. Yes. You selected the starting date based on the false perception you wish to portray. In other words you are trying to lie with statistics. And in this case, meaningless statistics. How is examining the "warming" data and finding no net global warming for 14 years lying? I didn't create the data. Are you calling all those climate scientists who provided the data liars, now? The poles - particularly the North pole changes from white snow to dark ocean/land as the ice melts. Prompting more ice melt. Which matters how, when there is almost no sunlight much of the year? And, that's not a greenhouse effect. How do greenhouse gases affect the North Pole the fastest? You do know greenhouses need sunlight to work, right? They use polar temperature information. They're quite satisfied with their procedure. So, aren't you essentially saying the climate scientists who gathered this data are lying? selecting a start date that is an exception rather than the norm, and then presenting this as a representative sample of the real world when in fact it is nothing but the maximum amount of bias you could find. What are you talking about? There's no bias. The period goes back as far as it goes back. It's just an analysis of the data. There's been no net global warming since 1997. So no matter how you slice it, global warming has stalled out. This first reference says nothing invalidating 10 year trends. over the last dozen years, the earths average temperature has remained relatively steady during a time period when the globe should be warming rapidly as a result of human greenhouse gas emissionsor at least that is what all of the climate models are projecting should be happening. And that's from October 2009! This one says nothing about 10 year trends. And this one again supports 10 year analyses. Statisticians say that in sizing up climate change, it's important to look at moving averages of about 10 years. So, it looks like you've saved me the bother of proving you're wrong (again!). Thanks! Every place on earth has equal amounts of daylight over the course of the year. Maybe so, but not equal amounts of solar radiation. I did. There's surprisingly very little on it. ....clearly too much to explain in a 1000 words to someone who thinks any place on earth gets less sunlight than any other place. Clearly too much for someone who would confuse sunlight (as in daylight) with sunlight (as in solar radiation and the greenhouse effect). I love how Uba admits (below) to cherry picking but has steadfastly denied doing just that. All you're doing is proving you don't understand statistical analysis. If there was no stall, I couldn't show such a statistically significant trend (thanks,again, for proving it really is statistically significant). It has been explained to you twice. Are you incapable of understanding the simple answer? Or are you so corrupt that you will continue to ask the same long questions over and over again just to instill doubt in the minds of others? Giving a non-answer and claiming it's an answer, is not an answer. Answer the question properly and provide references. If they were satisfied Tard Boy, then why have they made an effort to include more of the polar region in their latest data set? And now that they have stopped excluding the polar regions we find that your claim of no warming for the last 14 years is even more of a lie than ever. ...so the trend would likely be the same if they hadn't withheld data. Last 14 years, Most Modern HadCrut data set. How can it be the "most modern" if it doesn't include the latest available data? The shorter the period you select, the more irrelevant the computed trend becomes. 10 years is pretty much meaningless as I have repeatedly told you and shown you before. Sorry, you can't go there anymore. You proved with your own cherry picked references that I was right all along. 10 years is statistically significant. I'm sorry you couldn't understand the answer. There is a limit to how primitive my explanations can be in 1000 characters. This link has nothing to do with greenhouse effects at the poles. All you gave was another non-answer. Aside: Why are climate 'bots so dumb? When are they going to develop a climate 'bot that can retain content and understand references? You have never shown the statistical significance of your claim. I don't need to. You already proved it with your own references. "there is a startling absence of correlation between the CO2-concentration trend and the temperature trend, necessarily implying thatat least in the short termthere is little or no causative link between the two"
Today and the Newspaper Revolution describes him as "a fervent, forthright and opinionated Roman Catholic Tory" who has been closely associated with the "New Right" faction of the Conservative Party. Is he your hero now? Re: Google search on global warming in the polar regions. Very little? 22.5 million results is very little? And you still couldn't provide even one relevant reference? But we already know you can't understand content. So go ahead and provide one of these "22,500,000" references. I'm up for a laugh. Outright lying is all you have left. Statisticians say that in sizing up climate change, it's important to look at moving averages of about 10 years." Science may allow for a better understanding of future events and may not depending on the data and skills available but science is not "all about predicting the future." They start very closely matched, yes, and then become increasingly divergent as the northern polar regions have continued to warm. HADcrut4 is DESIGNED to show global warming, even if there isn't any. If this wasn't their intent, why then have they failed to include the data from last year? So fine. Let's just agree (for now) that global warming ended 10 years ago. And when your cherry picked year 1998 is removed we obtain the following. You're an idiot 'bot. You've just "cherry picked" excessive data to overwhelm the current signal. So? All you're doing is adding old data to skew the signal. There's been no global warming since 1997. Your claim was that there wasn't much written about warming in northern regions. Right. And your Google search turned up no relevant results. Just because you had a lot of hits on a three-word Google search, doesn't mean you had any relevant results. Provide some links you think are relevant (again, I'm up for a good laugh). You have lost badly. And will always lose when you deal with me. Says the loser climate 'bot who's own references falsified its claims. UbVonTard focuses on the messenger, not the message. You're the one spouting off against conservatives all the time. Now, all of a sudden, you're a conservative supporter? Ice volume way below normal. North pole projected to be ice free in summer sometime around 2030. "Ice extent this March ranked ninth lowest out of the 34 years of satellite data for the month, but it was the highest March average ice extent since 2008 and one of the higher March extents in the past decade." "Ice cover remained extensive in the Bering Sea, where it has been above average all winter. Ice extent was also higher than average in Baffin Bay, between Greenland and Canada, and the Sea of Okhotsk, east of Russia." Really? Then why did you spend several days claiming that there was essentially no difference between Hadcrut 4 and Hadcrut 3? I was showing, by extrapolation, that 2011 should show a steep decline in global temperatures. Just like it "stalled out" between the years 1987 - 1997. Actually, your graph shows a slight rise. But I never suggested there was no warming before the stall, or that warming would not continue. All I'm saying is it stalled out at least a decade ago, inspite of steadily rising CO2. Therefore, the correlation between CO2 and temperature is doubtful. Meanwhile ice extent continues to be over 100,000 square kilometers less than normal, and the deficit is growing larger with each passing day. Idiot. Your own chart shows it to be quite close to "normal," relative to the 1979 to 2008 trend. Liar. You don't know anything about being a scientist. As a moderate Democrat and Obama supporter I don't agree with the Conservative point of view, myself. But being liberal, conservative, or inbetween is irrelevant to the discussion. That is, a good scientist seeks the truth, while putting ideological influences aside. How would you know? You haven't had time to review all 22 million of them yet. All you're doing is falsifying your own claim. Provide proper references, or admit you were lying.